During the stillness of the night, I can hear nothing but the silence that surrounds me. I can hear it because I am wide awake, while all the world around me is at rest. Father, I cannot find the words to tell you what’s wrong but, even so, I know You understand me. 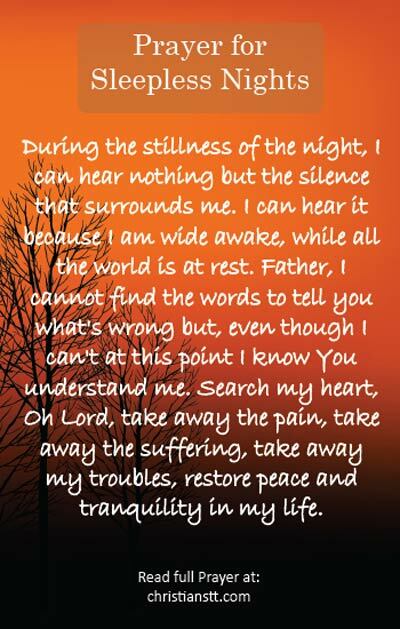 Search my heart, Oh Lord. Take away the pain, take away the suffering, take away the troubles. Restore peace and tranquility in my life. Give me strength to go on for I am tired and weary, but yet my eyes are wide open. Isaiah 26:3 – You will keep in perfect peace him whose mind is steadfast, because he trust in you. You alone know what I have been through and what I am going through at present and all that I ask is that You help me through it. Saviour, please hear my humble cry. I lie here sleepless because it worries me, I feel so burdened and alone. Please comfort me, I need You now more than ever. Wrap Your gentle arms around me as I sob quietly into the night. Restore that joy and happiness I once knew, for pain only endures for the night and surely joy comes in the morning. Allow me to find rest before the morning draws near, so that I can go out and face the world and all that life has to throw at me, in confidence and with a smile, assured that You are always with me and the battle is already won! In Jesus mighty name, Amen! Psalm 121:3-4 – He will not let your foot slip – he who watches over you will not slumber; indeed, he who watches over Israel will neither slumber nor sleep.